January 20th, 2010 by KTU | Filed under Baubilt Bread. Place teflon-coated baking dish on a digital kitchen scale and press “tare” to zero scale. Press “tare” again to zero scale. 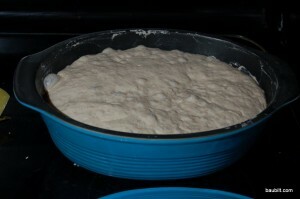 Mix the dough until it’s a uniform consistency (just a few strokes to get everything mixed thoroughly). 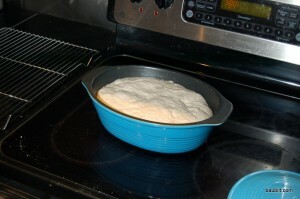 Let the dough rise in the covered dish for 5-10 hours, with 7-8 hours the ideal, depending on temperature. Mine rises at about 70F, the temperature in my kitchen. Dough after rising 7 hours, up close. Turn your oven on and set to 500F. Stir the dough to “knock it down.” The dough will be pretty gooey. 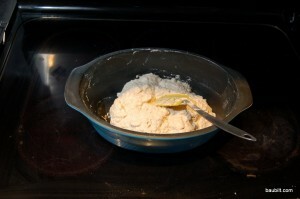 Wipe off the edges/sides of the dish to remove any dough residue so it doesn’t burn to a crisp in the oven. Put the lid back on and let the dough rest/rise while the oven preheats. Ready to bake with sides of dish wiped clean. 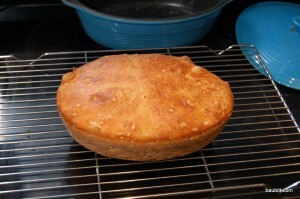 Remove the lid and bake for another 15 minutes (or until the internal temperature of the loaf, via an instant-read thermometer, 200F). 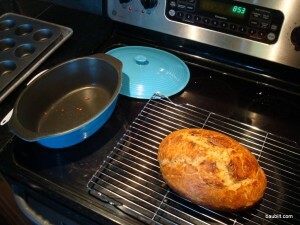 Of course you can bake bread without a teflon-coated ceramic baking dish. Before getting my baking dish I used a plain old 6-quart dutch oven (a stainless and aluminum model from Sur La Table with metal handles). But, you’ll probably need to use a bowl for steps 1-7 and then flop the ball of dough into a well-oiled pan before baking. I’ve never tried using a plain metal pan from start to finish, but I’m guessing the bread will stick badly to the pan if you try that approach. You do need to use a pan with a good lid, although I suppose foil might work. Yes, of course different flour types give different results. I use plain old U.S. all-purpose flour plus Trader Joe’s white whole wheat flour, but I’ve used all kinds with good results. The bread is sinful with 100 percent white flour. 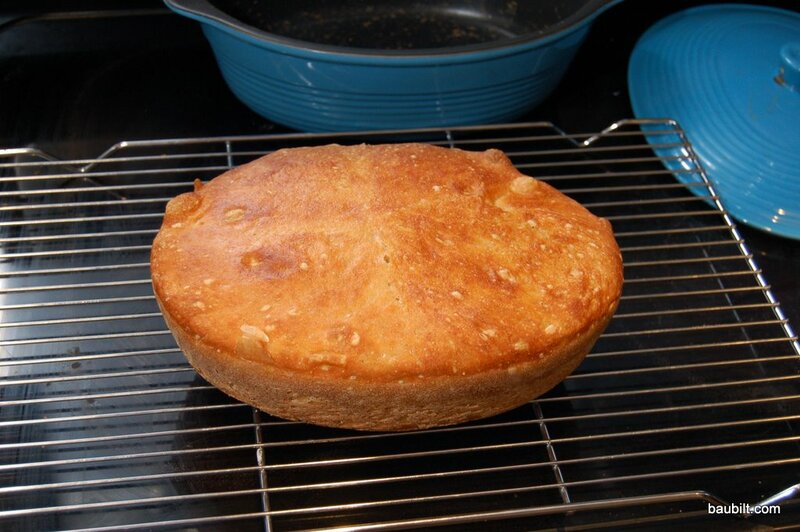 One third whole wheat provides a veneer of nutritional respectability without much compromise in yumminess. I use grams on the scale because the units feel nice and precise to me. I realize I’m mixing imperial and metric units. Sue me. A digital scale is a good thing to have in a kitchen, but if you don’t have one, then measure out 5 cups of flour (about 625 g) and 19 oz. water (563 g, which is 90% of 625 g). An instant-read thermometer is better than timing the baking. Let the final (uncovered) phase go until the internal temperature of the bread is 200F.